This phrase sounds simple but it can be difficult to do in daily life for some people. The recent bout of haze has been taxing on everyone. Difficulty in breathing, eyes irritation, throat discomfort, stomach discomfort, etc are quite common. It’s not a pleasant situation. People squeezed into lift and the lift was full before I could go in with my 10kg-stroller plus my girl inside. Most of the people in the lift were able body who could take escalator. I could swear or be angry but it wouldn’t improve my situation a bit. It would make it worse because I felt down, angry, and upset. My girl would think I was being angry with her and she could be withdrawing from me. Those things make me realize, I have a choice. I can choose to be negative or positive about them. Yes, at first, I might be irritated. BUT being irritated does NOT help me, in fact, it makes me moody, easily annoyed, and many other negative emotions. Kid will feel it at the slight ripple of the negative or positive emotions. Her mood is mostly the reflection of my mood. This is one of the reasons I don’t want to dwell so much on being negative. The negative emotions affect the organs in the body (read the article here). Another reason is related to my health being. Someone wise has shared that negative emotions would cause huge pituitary issue. Some of the signs are depression and horrible negative thought patterns. When this happens it causes the chemistry of your brain to change and causes all these death hormones to start taking place instead of good hormones that will help you with life. Pituitary gland only weighs 0.5 grams, yet, it controls the growth and development and the functioning of the other endocrine glands, such as metabolism, physical growth, reproduction function, blood pressure, thyroid, adrenals, ovaries, and many others. No wonder that the phrase “happy person, healthy person” is quite apt. Emotions are indeed play a great part. 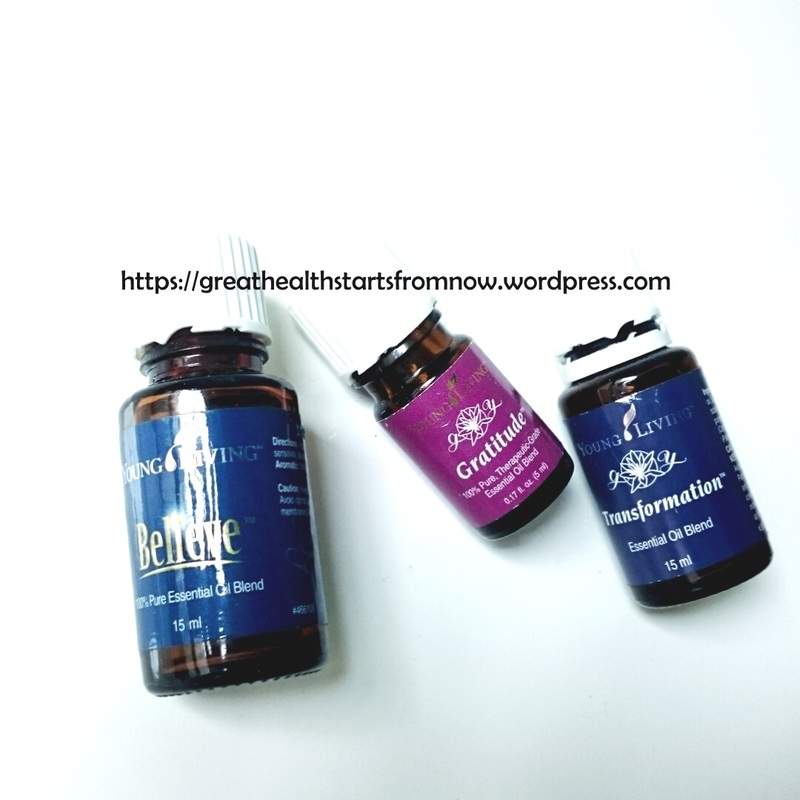 These few weeks, I have been diligently using Transformation and Gratitude Essential Oils on top of my daily Believe EO. I have been noticing a shift in the emotion. I feel better, happier, and not easily irritated (take note that different person will have different effect, you just have to find your own personal oils!). Believe is a wonderful oils with Balsam Fir, Coriander, Bergamot, Frankincense, Idaho Blue Spruce, Ylang Ylang and Geranium. It’s great support for hormonal, tiredness, etc. Transformation has Lemon, Peppermint, Clary Sage, Sandalwood, Idaho Blue Spruce, Sacred Frankincense, Cardamon, Palo Santo, and Ocotea. It empowers and upholds the changes you want to make. It uplifts mood. Gratitude has Balsam Fir, Frankincense, Coriander, Myrrh, Ylang Ylang, Galbanum, Bergamot, Geranium. It elevates, soothes, and brings relief to the body.